The Mitsubishi F-2 is a multi-role aircraft developed in cooperation between the United States and Japan. As part of a complex political arrangement, General Dynamics provided F-16 technology to Mitsubishi Heavy Industries, who then developed the F-2. While the overall external appearance mimics that of the F-16, the F-2 is a larger aircraft and features more advanced electronics than the F-16 of the day. The first F-2 flew in 1995, and nearly 100 were produced, with the last one rolling off the assembly line in 2011. 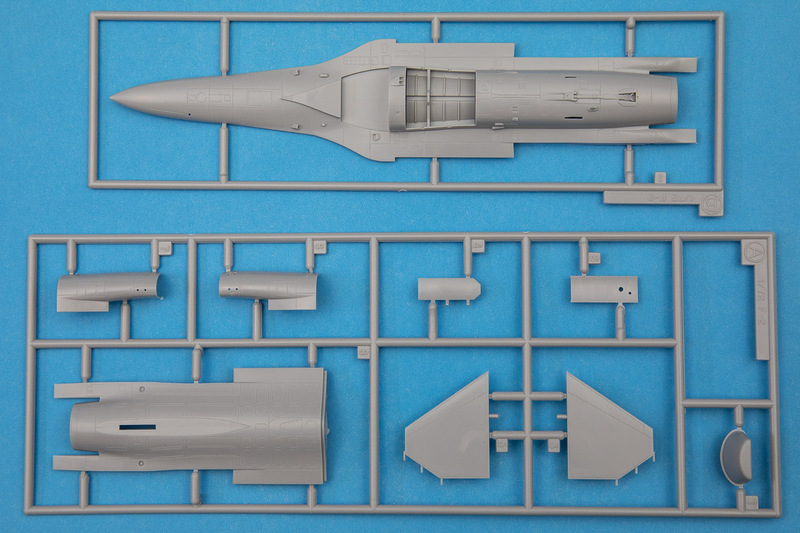 Hasegawa's 1/72 kit of the Mitsubishi F-2 is the only option in town, and luckily it's not that bad. 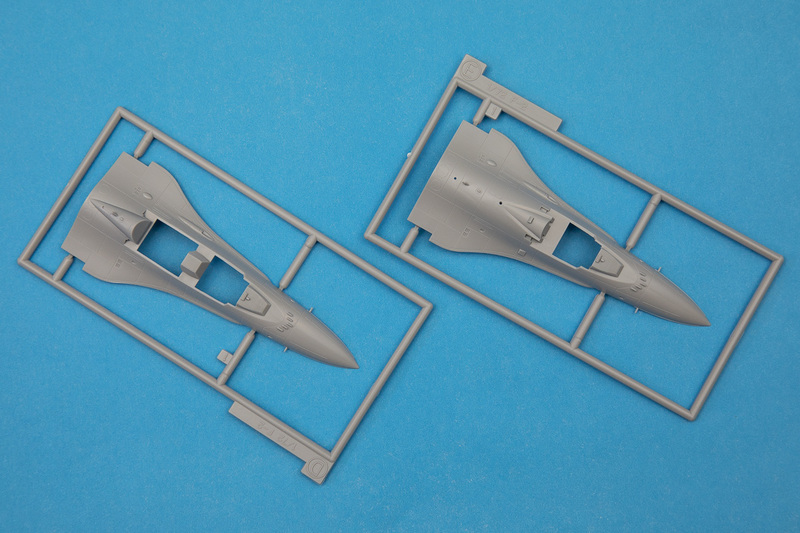 Molded in the standard Hasegawa light gray plastic, this release provides two kits in the box, one single-seater F-2A and one two-seater F-2B. 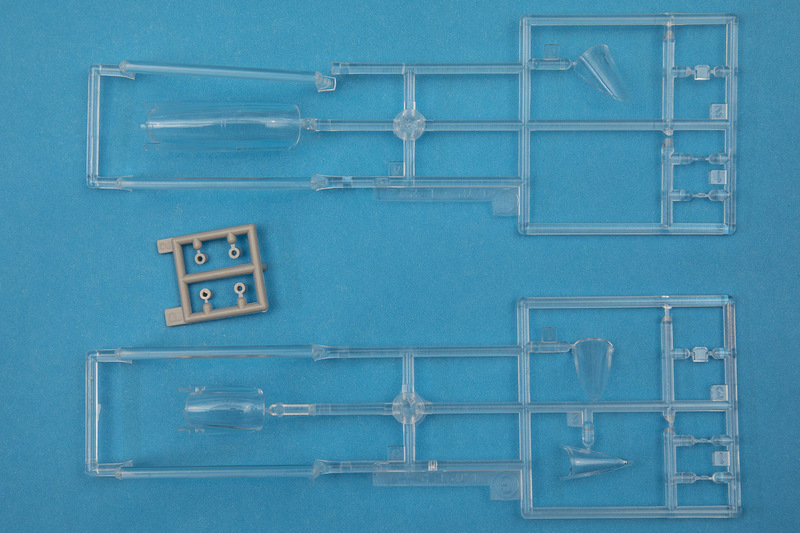 Like kits of the F-16, this one is engineered to maximize parts commonality. This means that most of the assembly for each one will be similar or the same, with the added challenge of additional seam work for those areas that are different between the two. For marking options there is only one option for each variant. 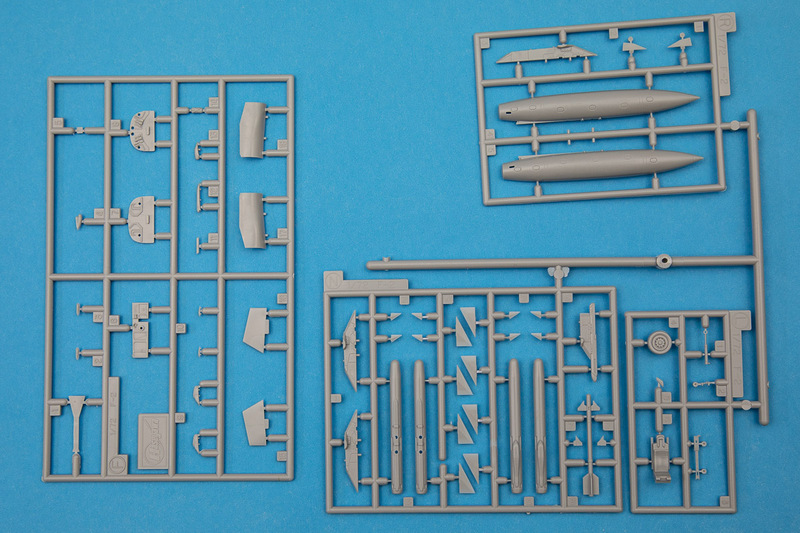 Starting with the interior, this is typical Hasegawa, with a fairly complete setup provided, but with flat detailing. The instrument panels and side consoles are detailed solely through decals, while the seats lack belts. There are separate control columns, though, and with some added belts and maybe a bit of extra plastic card on the side consoles, you can come away with a good enough interior. For those wanting something more, though, aftermarket will definitely help here. With the interior done, the next step is the fuselage assembly. Here we get the main difference between the F-2A and F-2B: the upper forward fuselage. 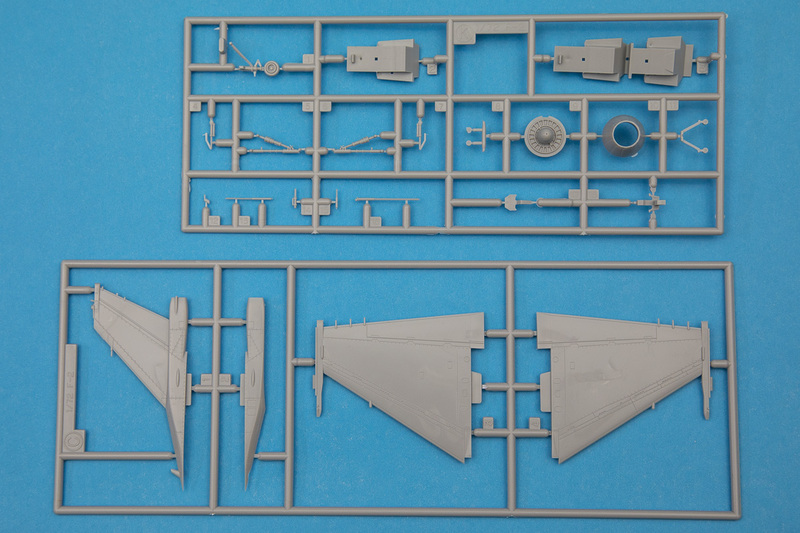 The lower fuselage is one piece, but the upper is split into a front and rear piece to accommodate the variant differences. Inside these parts goes the main wheel bulkheads, the rear engine face, and some plugs for the stabilizers. The instructions also indicate that weight is needed in the nose, so be sure to pack some of that in there before closing it up. Flipping the fuselage over, the intake has a one-piece lip and trunk, with a separate splitter vane, which fits into a right/left intake assembly that has a separate nose wheel well insert. On the outside of this are various bumps and bits, with some differences between the A and B variants. Moving on to the flying surfaces, these are, for the most part, single pieces. In fact, the only assembly for these is the vertical fin, which has a separate half for the lower base. The wings will slide into slots, the stabilizers into those aforementioned plugs, and the assembled vertical fin into a flat section on top. Flipping it back over, the landing gear is fairly simple, yet robust so there will be little worry of it holding the finished model. The nose gear strut incorporates the nose wheel, which means some careful painting is in order, while the main gear has separate wheels. The last step is to add the canopy, which can be posed open or closed. Given the dearth of cockpit interior, I would recommend closed. For camouflage schemes, both the F-2A and F-2B options carry the standard camouflage consisting of shallow ocean blue and deep ocean blue, with the radomes in a lighter gray. The single-seater option is an F-2A from 8th Squadron, 8th AW from November 2016 at Tsuiki AB. This aircraft has a cool panther logo on the rear tail. 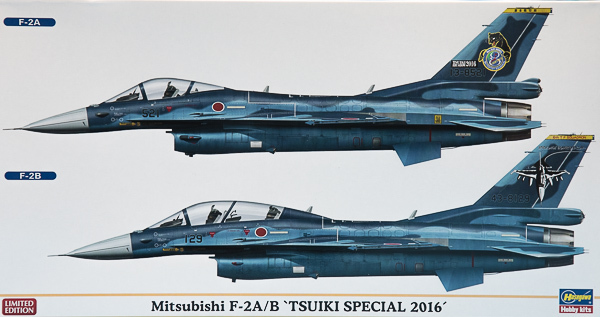 The two-seater is an F-2B from 6th Squadron, 8th AW, also from November 2016 at Tsuiki AB, and it features a neat head-on illustration of an F-2. Both options will look good alone or together, as they are from the same base at the same time. For those looking for something a little different from your standard F-16, the Hasegawa F-2 offers something that will definitely stand out. With two kits in the box, you have an even better setup, as you can cover both the single-seater and two-seater in one go. 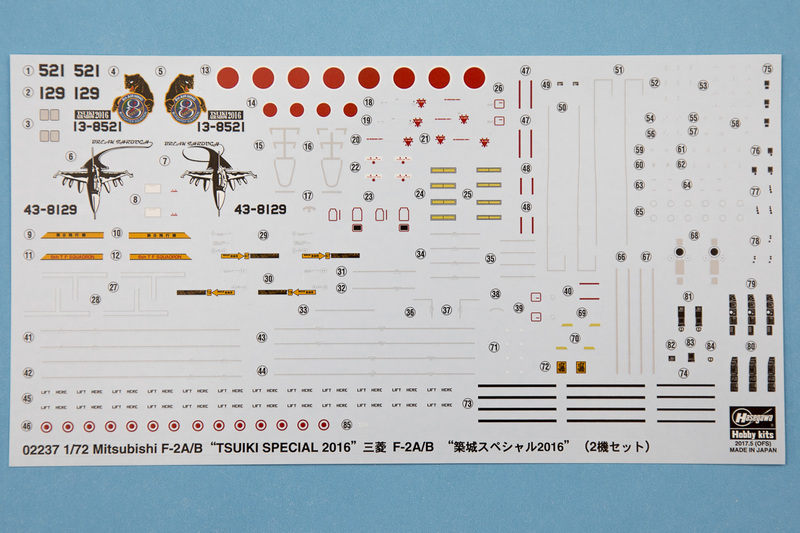 My thanks to Hasegawa USA for the review sample.